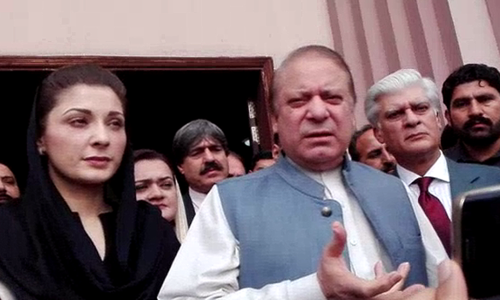 Adiala Jail administration on Thursday cancelled a meeting between incarcerated former premier Nawaz Sharif, his daughter Maryam Nawaz, and son-in-law retired Capt Muhammad Safdar, and their legal team. The legal team was trying to meet the Sharif family detained at Adiala Jail following their conviction in the Avenfield properties reference. On Wednesday, lead defence counsel Khawaja Haris told the accountability judge that jail authorities were not giving him access to his client, Nawaz Sharif. After court proceedings, as per the legal team of Sharif family, the jail superintendent called Haris and permitted the legal team to meet with its clients. The jail authorities then, with the consent of the lawyers, fixed their meeting for 11am on Thursday. The legal team moved from Serena Hotel at 9am and, as they reached Adiala Jail at 11am, were informed by the jail superintendent that the meeting had been cancelled. Subsequently, they returned without meeting their clients. Speaking to Dawn, Haris said that the "legal team comprising Amjad Pervaiz, Barrister Saad Hashmi, and Zafir Khan had been requesting jail authorities since the day before to allow us to meet our clients in jail so that we can confer with them regarding their future strategy." 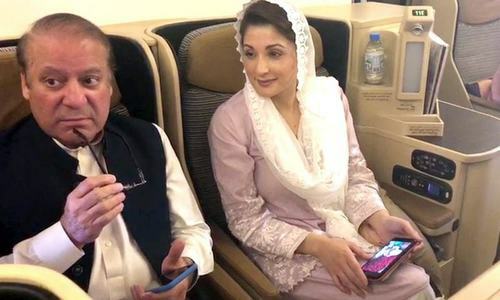 "We requested the jail authorities to allow us to meet yesterday (Wednesday) but we were not allowed [to meet them]," he said, adding, "Eventually we were asked to come today at 11am to meet Mian Sahib etc. at Adiala Jail. While we were on our way and had almost reached, we received a call from the jail superintendent and were asked not to come today as our meeting had been unilaterally cancelled." According to Haris, an Adiala Jail assistant superintendent had explained that the lawyers' meeting had been cancelled since Thursday is for visiting family members and others. He claimed that the jail administration had asked them to suggest a date for another meeting, but were not giving them any assurance that the same would not happen with their next meeting. He added that it was not possible for professional lawyers to work freely and independently if the behaviour of jail authorities continued to be humiliating. Jail officials did not attend repeated telephone calls when contacted by Dawn for a comment on the matter. Meanwhile, a delegation of the Pakistan Bar Council (PBC) today met Sharif, Maryam and Safdar as 'observers' to assess the conditions they are living in. Speaking to reporters after the meeting, PBC vice chairman Kamran Murtaza said Sharif and his daughter Maryam are both being kept in isolation, away from other prisoners. There is a distance of half a kilometre between Sharif and Maryam's barracks, he added. He quoted Sharif as saying that he was made to sleep on the floor on a thin mattress on his first night in jail. "According to him, the room was stinking and the washroom was in a bad state," Murtaza said. Maryam and Sharif met today (Thursday) for the first time after their last meeting on Sunday, he added. He said a cook prepares the food for the Sharifs from the ration that is sent from their home. However, he said the Sharifs complained that they are not asked about their food requirements in advance and the food ingredients "start to stink" by the time they are handed over to them. Murtaza said the council's objective is to see justice being meted out to everyone and that "the justice should be seen". Murtaza said they will contact the interior ministry through the attorney general, and the jailer, to have the issues faced by the Sharifs in the jail resolved. Besides Murtaza, the delegation comprised former presidents of the Supreme Court Bar Association Abdul Lateef Afridi and Muhammad Yasin Azad, PBC member Azam Nazeer Tarar and Sindh High Court Bar Association ex-president Khalid Javed. So jail authorities followed procedures. It is disingenuous for the legal team to claim uncertainty over another meeting when they can choose another day and call before leaving their 5 star hotel. 3 time PM not given access to his lawyer. This only happens in Pakistan. If Thursday was a day reserved for allowing the family meetings, then why did they fix the lawyers meeting in the first place? Height of indifference and inefficiency of the jail authorities. What we learned that 'Judge do no speak but their decisions speaks' but here in this case people are watching as well. as you sow so shall you reap!!! Yesterday people were saying that because only Thursdays are for meeting the Shariffs should not be given any preferences and their lawyers should meet them on Thursdays alone. I wonder what excuse the same people will come up with today. What a shame. The people who are paid from the people's money must learn to act with decorum. If an appointment is made there is no reason to cancel it arbitrarily. The accountability must be held important. Is there any rules to control such conduct by the jail authorities. Each prisoner only have limited visiting hours. Rules in democracys can not be broken for anyone. This has turned into a farce. How can the jail authorities stop legal counsel from meeting his client? Shameful antics! The caretaker govt is fast losing its credibility! Arm twisting techniques at every stage for Nawz Sharif and his legal team. Why so much fuss and drama on a non issue ? How many times lawyers have not been able to meet their clients at Adiala Jail ? This has happened before, and will continue to happen forever. Why is it such a big deal for a certain "convict" ? Makes you speechless !!! State above state. No blame on Jail authorities. This caretaker govt is trying his hard to let Nawaz Sharif be a world class leader just like Nelson Mandela. what was harm if legal team could meet his client todays instead of this headline with every newspaper and news channel and even with foreign media. The more I follow this case less convinced I am on the conviction. It will be tragic if this conviction turns out to be political. Another PMLN tactic to gain sympathy... They tried it with his jail conditions which we all now know are better than some 5 star hotels in Pakistan. @Ahmed , More than 3 times Shariffs promised the nation that energy crises will be solved within 6 months. This only happens under PMLN government in Pakistan. Sharifs need to come clean, return stolen money, apologize to the nation, make tauba. We are a gracious and forgiving people but we cannot show weakness to corruption. Leave Nawaz and other two criminals alone , let them enjoy jail life. @Ahmed 3 times elected by rigging election procedures and methods. Sharif has been given more rights and privileges than what he has given to a common man! It's like when Shariffs don't show up in court or cause delays in a hearing, now shoe is on the other foot. The man is a criminal. We don't want to hear what happened to him. He will be in jail for 10 years. Let us welcome him back when he is released after 10 years and after paying back all the money he has stolen from Pakistanis. Until then, let us leave him to do whatever he is allowed to do in prison. We really do not want to hear on a day-to-day basis as to what is happening to him. We are just not interested. Jails have rules for visitation. If rights of 3 time PM can be trampled like this, what can a common man expect ? They won't allow Nawaz to run the PML-N from jail. @Usman ... How can Nawaz have a personal chef make his meals? This is not the end of the world as I am sure another meeting will take place soon. Mian Sahib and Co are not going anywhere so enjoy the 5 star luxury Mr Harris. @Ahmed ... Don't fret. He will have access to his lawyer after the election. His lawyers have filed an appeal. How much more do they have to talk about until the appeal process is over? He is a convict serving time. @M.M ..... What excuses will Nawaz and Maryam come up with today? @Shafiq .... Yes, and there are rules to control the prison population, of which Nawaz is a part. @Truth is truth ... Nawaz is not going to be allowed to have parties in his jail accomodations and entertain his guests. why the meeting? the court make a decision now complete 10 years, and 7 years,1 year, jail is not conference center.!!!! @zia That's been real. Thanks. The Sharif brothers nurtured this system for others for many years. Now they are facing what other prisoners face on a daily basis. People with eyes and minds should heed themselves. Speaking of special treatment. How can anyone expect these convicted politicians to care about the people, their complaints were only limited to themselves, a real leader would have complained about the way every prisoner eats and sleeps.